Fallout 3, the way it was meant to be. -only one mini nuke available on the dead bos paladin at the gnr plaza, only one shot on the behemoth, make it count! have a perk that gives them combat armor DR and reavers have a perk that gives them metal armor DR. All super mutant overlords are level 15. Mirelurks can't open doors. -You can't pickpocket dogs. Enclave eyebots help friends and allies. Alien workers are unaggressive and you won't lose karma for killing them. tanks (as is the case in new vegas) as well as remaining lore friendly with directed energy dispersion given to users of tesla power armor. -trogs have a 2d10s DOT, don't get swarmed! -Cyborg: 50% less hp loss from rad sickness and 10% critical chance with all Energy Weapons. -Educated: no longer has requirements, cannot take along with Tag! Grenade and Explosive Changes - added better grenade bouncing physics; increased damage, force, and radius for missiles excluding EVE versions. Barter is Important - renamed to Reasonable Barter and Repair (REQUIRES FOSE), now repair price from traders is affected by repair and barter skill. Changed Buy base to 1.75 and mult to -.75, changed sell base to .15 and mult to .6 preventing you from being the richest person in the wasteland at level 5. Stimpak Changes - renamed to Stimpak and RadAway Changes, increased cost of radaway and rad-x by 3 making it 80 and 60 respectively, radaway heals over time 6 per 10 seconds (10 more than normal because of the severity of radiation), decreased stimpak cost from 125 to 100. Loot is Rarer - made loot rarity more balanced, made vendor chance none lower, made loot chems healing chance none higher, stimpaks are no longer guaranteed to be found in first aid kits. Rebalanced Health - removed endurancemult, removed behemoth and gargantuan (MMM), altered overlord health to 920 for MMM users. Skillpoint Changes - reduced skill point base from 6 to 5 because of the stronger Tag skills, luck giving 1 skill point per, and books in the wasteland, changed agility formula from base 65 to 30 and mult from 2 to 6. Increased Weapon Damage - renamed to Increased Damage, melee mult to 1, avdunarmedmult to 1, unarmedmult to 1, avdunarmedbase to 1. Crippled and Burning Effect Changes - renamed to Stronger Negative Effects, doubled negative withdrawal effects, removed flame fleeing effect. Increased Maximum DR - renamed to Maximum DR and RR 95%, added 95% radiation resistance. Increased Radiation - increased wade from .4 to .5, swim from .8 to 1. These are new modules that are included in the full version. (NEW!) Bullets and Physics - bullet shells stay put, better death physics, autoaim fixed, realistic projectile speed, bullet impact view distance increased, vehicles no longer detonate, 25% less weapon and armor degradation, increased chance of weapon jamming, natural pipboy light. (NEW!) Stealth Tweaks - Tweaks the gamesettings for stealth to put more emphasis on line-of-sight, audio actions have more penalties (firing in a building WILL get you spotted), light also plays a more significant role, armor weight affects sound more (works well with power armor tweaks). These are new optional modules that operate the same way as the other modules, but are not included in the full versions. (NEW!) Perks Overhaul (REQUIRES FOSE) - A lot of stuff. Check out the perks list in the level up screen to see more, I'm too busy to list them all here. Just know that I highly recommend it as it provides a much needed balance and re-working of the vanilla perks. (NEW!) Flee When Burning - I made a separated module for this effect, removed from the full Simple Realism packs, fixed bugs so it should work as intended. (NEW!) Power Armor Tweaks - Adjusts strength bonus and agility penalty for all power armors. All power armors carry themselves by adding carry weight equal to the armor weight. Increased radiation resistance and added rad resistance to helmets. Tesla armor no longer boosts energy weapons skill, but instead, gives 15% bonus damage resistance to incoming energy weapons fire. All power armors give a significant sneak penalty depending on the model, increased value, increased conditition, increased damage resistance, increased weight for all vanilla power armors, awesome stuff! (NEW!) Higher Vendor Repairs - Simply increases the the repair skill of the prominent repairmen around the wasteland and in a few DLC's to make fixing your gear at merchants more enticing than putting points into the Repair skill. ﻿Simple Realism is a gameplay enhancement mod in development for over 6 years which has been painstakingly tuned and playtested to provide a more challenging and rewarding Fallout 3 experience. There are no new items or new mechanics added so you can jump right into a new playthrough without having to learn about all the changes like you do with other mods such as FWE. The experience is intuitive, lightweight, and refined to feel like this was the way Fallout 3 shipped originally! 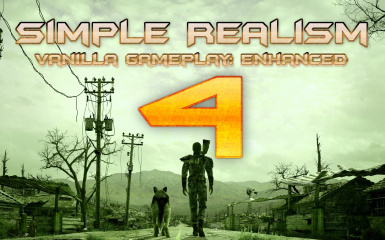 Version 4 of Simple Realism is meant to be the only gameplay overhaul mod in your load order in order to provide a seamless experience throughout the game. You can choose the Complete edition which incorporates all of the gameplay changes or the Modular edition where you can pick and choose what you would like to add to your game and what you don't depending on your preferences and modlist. I highly recommend starting a new game to make sure that the changes to loot and perks work properly. Check out PC Gamer's article about Simple Realism! These are the eight modules that are included in Version 4. The Complete edition incorporates all of the modules into one file. ﻿﻿The primary goal of this module and the reason for making Simple Realism in the first place is to make combat more dangerous for both you and your enemies. The wasteland is a dangerous place and life is short for most. The risks are high, but the rewards are too. -Body part damage multipliers for all NPCs and creatures have been increased by x3. This means that regardless of the weapon used or who's doing the fighting, everyone will receive three times the damage dealt by all sources. -To make sure that ranged weapons (guns, big guns, and energy weapons) aren't the default choice for combat, this module also modifies settings that will increase unarmed and melee damage that scales with your Unarmed skill and Strength, respectively. A small addition is that crippling the torso has a high likelihood of causing a stagger animation which gives you more breathing room when using melee and unarmed weaponry. -In the vanilla game, Super Mutant Overlords would do 40 extra damage to the player per shot with tri-beam laser rifles that was not affected by your damage resistance. Likewise, swampfolk did an additional 35 points of unblockable damage to the player. Both of these buffs have been disabled. -The stealth changes are aimed at making stealth more tactical allowing you successfully get behind an enemy and take them out, but open and well lit areas are nearly impossible to sneak through. The changes in this mod will ensure that line of sight, the sounds you make, and your skill points in Sneak are more important and enemies that detect movement will spend more time searching for the source than they normally would. -The likelihood of succeeding with a pickpocket attempt has been re-balanced so that it scales more appropriately with your sneak skill. ﻿Ammo boxes are part of Bethesda's reward system for exploring the world and fighting bad guys and are a useful way to motivate the player to keep wandering around. However, you can quickly amass a huge stockpile of ammunition in a short amount of time. This problem is exacerbated by the increase to damage multipliers which means that you require fewer bullets to dispatch enemies. -With Simple Realism you are still guaranteed to find ammunition, grenades, and mines in their respective boxes, but the quantities have been lowered considerably. -Mine and grenade boxes only drop one of their respective items. -Darts and railway spikes have been removed from drop lists entirely and you must rely on finding them as objects in the world. -Creatures will no longer drop any items of value. You will only find meat, blood, or hides depending on the creature. This change is particularly important with regard to ghouls which are an easy source of caps and bullets in the vanilla game. -Super mutant gore bags no longer have caps and bullets in them and Deathclaws now drop two hands as you would expect them to. -First Aid boxes, like ammo boxes, are also treasure troves of items. Now, however, they are guaranteed to only give you one stimpak and have a much reduced chance of finding other chems. -The amount of loot you can escape Vault 101 with has been considerably reduced. -All chems have weight and pre-war money is no longer as valuable. -Stimpaks and RadAway cost more caps and heal over time. This has a considerable effect on combat as you can no longer open your pipboy and return to full health instantaneously. Only food, drinks, and blood packs heal instantly. -The mailbox outside of Vault 101 in Springvale only has 1 grenade. ﻿Arguably the most drastic change in Version 4 is the Gunplay module. The goal was to fix a lot of the mistakes in the FPS system to enhance the feeling of combat and get the sensation that you are using an actual weapon. Fallout 3 adds a built-in spread to every ranged weapon which essentially means that bullets fly out of the barrel at random directions. -The Gunplay module removes spread from every single ranged weapon in the game. To compensate for this change, the sway of the character's arms has been increased. Now guns will fire where their model is actually pointing! The appropriate weapon skill will reduce this arm sway considerably with a total removal of sway at 100 skill level. Using the zooming feature (iron sights) and crouching is now essential to landing perfect shots on enemies if you don't have many skill points. -Weapon models no longer drift up and down depending on where you are looking. -Doubled the animation attack multiplier for all semi-automatic weapons to reduce the delay between clicking the mouse and firing the weapon. -Bullet projectiles have also been overhauled. The speed of projectiles is roughly equivalent to their real-world values depending on the caliber. Hitscan has been removed so that enemies take damage when you see them hit by a projectile and bullets should pass through more transparent textures. -Energy weapons have been significantly overhauled by increasing damage across the board. In the vanilla game there was hardly any reason to use energy weapons because guns had more ammo, fired faster, and could do more DPS. Now, however, energy weapons become viable as a late-game weapon category such as they were in Fallout 1 and 2. This change carries over to robots, sentries, and the enclave so that you have to become more tactical with your engagements. -The chinese pistol and the .32 pistol have had their damages tripled so that they are now viable weapons. In every way they were inferior to equivalent weapons such as the 10mm pistol and the hunting rifle ensuring that no one would use them. -The animation that causes your screen to shake when an explosion detonates nearby has been shortened considerably so that you don't spend so much time moving aimlessly about unable to focus your reticle on an enemy. -Auto aim has been removed so that long-distance shots (particularly with scopes) will land where you aim instead of being pulled to the torso by the game's code allowing for headshots. -The chance of your weapon jamming has been considerably increased to add tension to firefights. -All NPCs which offer equipment repairs have had their skill levels increased. This synergizes which the changes to repair costs so that you don't have to put points into repair with every single character build and can use the points for other skills. -Nearly all creatures and robots have had their base damages doubled. The changes to bodypart damage ensures that you can kill enemies quickly, but they will drop your health quickly if they get in range. Don't let yourself get swarmed! -Feral Ghoul Reavers, Swampfolk, Albino Radscorpions, and Super Mutant Overlords have had their health values rebalanced so that there are no more bullet sponges. -Alien workers have had their karma reset to neutral so that you don't lose karma for killing them. -Radroaches are now very aggressive and will attack if you are within their aggro radius. -Centaurs have been buffed. They move quicker, have a greater reach, and their projectile vomit is faster. -To match their terrifying description, all Super Mutants have a buff called FEV Enhancement which gives them damage resistance, increased melee damage, and increased unarmed damage. -Feral Ghoul Roamers have damage resistance equivalent to the combat armor that they wear. Feral Ghoul Reavers have damage resistance equivalent to the metal armor that they wear. -Trogs now have a poison effect called Pitt Rot which causes damage to you slowly over time. -The dead BOS paladin at the GNR plaza only has one mini nuke. Make it count! ﻿The Perks and Karma module is, like the Gunplay module, one of the more drastic overhauls. It rebalances nearly every perk changing their requirements or even their effects to provide options for nearly every type of character build with tiers depending on your level. No more useless perks! None of the perks give skill points and those that did have been modified to give bonuses that align closely to their description or fill in a gap for playstyles. These are the perks that have had their effects modified or completely changed. -Educated: extra 2 points per level. Can not take if you've taken Tag! The maximum range has been adjusted to -1500 to +1500 so that it takes more actions to change karma levels. -Every explosion causes a knockdown if you are within the blast radius. Use this to your advantage, or get taken advantage of by enemies with explosives! -The game's timescale has been adjusted to 24. This means that days and nights last a bit longer than before. -Your movespeed is considerably reduced if one or both of your legs are crippled. -The height at which you can safely drop down from has been reduced and the damage you receive to your legs from falls has been increased. -The ragdoll physics of dead corpses has been adjusted so that they fall more realistically and no longer get tossed aside like, well, ragdolls. -Grenades fly faster and further out of your hand and they no longer bounce like rubber balls. Now you can actually make them land where you want to. -When you drop mines they now land in front of you instead of at your feet. -All vehicles require x3 more damage before detonating. The detonation was removed in earlier versions of simple realism as it isn't realistic and firefights in DC were impossible, but it's a neat gameplay mechanic and now it's a bit more reasonable. -The tutorial messages are no longer popups, but are now corner messages that fade in 5 seconds. -Distant gunfire sounds have had their range doubled so that you can hear engagements at further distances and go check them out! Power armor is now finally worthy of the respect it garners from the game's lore and the fans of the series. -The armors retain their tiers going from T-45d --> Enclave --> Tesla --> T-51b --> Hellfire in order of stats. -Damage resistances, item durability, item value, and radiation resistances have all been increased. Agility penalties have been removed. -All power armor weighs a lot! However, the armor has an increased carrying capacity equivalent to its weight when equipped. -All armors reduce your sneak and are flagged as Heavy to reduce your movement speed. Tesla Power Armor and Medic Power Armor reduce your sneak to 0. -Power armors now take additional damage from EMP grenades and mines. Use this to your advantage vs. the Enclave! However, Tesla armor negates this damage entirely. -Power armors will increase the size of your player model when wearing them. -Power Armor Training is now a perk called Power Armor Proficiency which you can acquire at Level 16 from the perk selection screen. -All unique armors (including cut armors) are affected by the changes. ﻿This module is meant to influence your choice of character build to provide more incentives to using the underutilized SPECIALs and Skills and rebalance gameplay elements not touched by the other modules. -Your base HP has been drastically reduced, but your HP per point in Strength has been increased to reduce the overall possible HP, but put a stronger emphasis on SPECIAL points. -Your base AP has been drastically reduced, but your AP per point in Agility has been increased to reduce the overall possible AP, but put a stronger emphasis on SPECIAL points. -Leveling requires double the amount of XP to advance. This slows down the progression of the game and forces you to spend more time doing quests and other tasks to level up and so that you don't reach the endgame without exploring most of the world. Changing the difficulty does not change the amount of XP you gain. -You no longer start with a base level of skill points. All skill points come from your SPECIAL stats and each point gives 3 points to each skill affected by the SPECIAL stat. All SPECIALs affect two skills each except for Charisma which affects three. -The base number of skill points to assign per level has been reduced from 11 to 5. You still get 1 additional point per level of Intelligence. -Bartering is a lot harsher. Merchants will make you pay through the nose and they will only throw you scraps for your items. When you have put a number of points in the barter skill, however, you may find yourself making more than you could have dreamed of at the start of the game. -Repairs at merchants are now equal to the value of the item instead of twice the value. -The Megaton bomb now requires a repair skill of 50. Did you really expect to tinker with a thermonuclear device straight out of the vault? -All traps have had their repair and science skill requirements rebalanced. For the most part, the numbers have been increased so that they still present a challenge throughout the game. -Withdrawal effects from all drugs have been increased. Having your head crippled now reduces your AP by 40. -No more healing by sleeping in a bed. Excellent mods in my opinion, try them out for yourself! ﻿The Complete edition is incompatible with any mods that change vanilla weapons, the NPCs that perform repairs, creatures, or bodypart data. This means that FWE, WMX, MMM, and EVE are incompatible with the Complete edition. If compatibility is a concern, choose the Modular version and select the modules you wish to use that do not conflict with the other mods in your load order. I will not make versions that support other mods. TTW is not supported. Please note: I have used no resources or original content from anyone else for this mod. The credited authors are listed for their mods that inspired additions in Version 4 of Simple Realism.